This morning I will draw on my experiences with pain and share some of the ways I have learned to live with it along with a few basic tenants of Stoicism. In the past 20 years I have dealt with chronic pain in multiple manifestations and undergone five major surgeries and a myriad of alternative methods that have rarely provided me with relief. I tell you this to set the stage not to elicit your sympathy, empathy, or pity. I would much prefer your friendship. In my youth I rejected nearly everything to do with Western culture. Seeing it all as elements of a failed system. In graduate school I developed a strong affinity to both Buddhist and Taoist philosophy, interests that continue today. Now in my old age my thoughts have turned to the very roots of Western culture, Greek and Roman philosophy. It began by reading Plato’s Socratic dialogues. This was a gateway to Stoicism that draws heavily on the remarkable, clever teachings of Socrates. It is said that Stoicism began with the Greek philosopher Zeno in the third century BC. Little remains of the teachings of any of the Greek Stoics but when the Romans revived the philosophy at the turn of the millennium it flourished for two centuries. I will not delve into the histories and variety of philosophers in this sermon. This morning I would like to focus on what Stoicism can teach us about living a good life in a difficult world and I would like to focus on the teachings of one Roman philosopher, Marcus Aurelius who lived 121 – 180 AD. He might seen as a rare example of what Plato called a Philosopher King. He was a Roman Emperor and a constant general of his armies. He was the last of what some historians have called Rome’s “five good emperors.” He wrote one small “book” that is usually titled “Meditations.” It seems he did not write it as a book and certainly not for publication but as an exercise in reminding himself what is important in life. It was written late in his life while his army was winter-camped along the Danube River in the never-ending and ultimately futile task of subduing the Germans. I would like to focus on certain parts of the book that I have found useful in trying to live a good life in difficult circumstances. For me the difficult circumstances take two forms: first, the persistent physical pain I experience; second, the emotional pain of living in what I perceive as an unjust, and cruel social system. First we need to determine what is a “good life” from a Stoic’s point of view. It is not a life without pain, without difficulty, without illness, without disappointment, without sadness, without death. Every life has those challenges and more. Marcus’ teachings give ways to be with those parts of our existence and have a good life. At its essence the good Stoic life is to live in accordance with nature. Not a nature of dancing through a daisy dappled meadow, although that could be part of it, but a nature of light and dark and the infinite shades between. Stoicism teaches that we must use our minds to think about what is happening to us and use our reason with both physical and mental experiences. In the experience of pain it is never simply physical or mental. It always has both components — the physical stimulates the mental pain and the mental stimulates the physical pain. Marcus says, rightly I believe, that our pain is our perception of an experience. Instead of reacting to the sensation with the emotions of anger, fear and dismay as I so often have, one can analyze physical or mental experience. We can understand accurately where the pain is in our body, what the true sensation is that we are feeling, and the actual duration of the sensation and intensity of what we are feeling. Do not even label it as pain. It is a sensation you are experiencing. This is using reason rather the emotions. Learning to understand what is happening within us rather than unknowingly emotionally reacting to it. While this will not remove the sensation it can significantly change the way you experience it. It has made pain more tolerable for me. It takes practice and determination to make this a habit when pain arises. We have an instinctual need to react to pain to protect ourselves, but this Stoic approach reacts with reason and not emotion. Another aspect of pain is that of duration. I have often perceived the pain I am experiencing as permanent. We can feel that we will forever be in this condition and we must do something rapidly to eliminate the pain. In modern times this can lead the individual to take dangerous drugs or rush into surgeries. Another key Stoic belief is that everything is in a constant state of change and this certainly applies to pain. Yes, it may worsen, but it also may improve on its own with some patience and endurance. Our bodies are remarkable in their self-healing properties but we often do not give them the chance to do so. I am not saying that there is never need for drugs or surgery as there most certainly is, but in some instances time gives us a healthier result than our corporate health system. In my experience the more attention I give my pain the worse it becomes. When I work in my studio I feel very little pain because my mind is totally involved in making my art. Even talking about my pain I have found a detriment. It simply brings the pain to the front of my mind and elevates the intensity. When you are in long term pain, again physical or mental, and you are giving it much of your attention you become desperate to relieve it. You are willing to try just about anything and I think I have tried just about everything over the past 20 years. Very well-meaning people have new ways to help you that has worked for this or that person. Sometimes it may help, for me often very short term, and many times it does not help me at all. I believe it may be a false assumption, and certainly a modern one, that we are to live our lives without pain. We have become convinced that modern medicine will solve all our health problems. We will all have some degree of pain on that Stoic spectrum. It is how we react to the pain, whether with reason or emotion, that will determine how it impacts our experience of the “good life.” Please keep in mind that my thoughts on pain and how I interpret Stoic ideas about pain come from my personal experience and everyone’s experience with this difficult subject is unique. While the concept of change has helped me in understanding my pain, it has a larger role in Stoic philosophy. My favorite quote from Marcus Aurelius’ little book is, “The universe is change and life is opinion.” His understanding of the universe seems quite extraordinary for the second century as does that of the many Greek philosophers he studied. Marcus writes, “Never forget that the universe is a single organism possessed of one substance and one soul, holding all things suspended in a single consciousness and creating all things for a single purpose that they might work together spinning and weaving and knotting whatever comes to pass.” That is a beautiful, poetic expression of the Unitarian/Universalist seventh principle. He held that the cosmic mind is a part of us and we have access to it when we live the good life in harmony with nature. Change is a topic that often arises in his reflections. He writes, “Look around you and see how everything is perpetually changing, and get used to the idea that nature loves nothing more than to change…. Change is a kind of river, an irresistible flood sweeping up men and events and carrying them headlong, one after another, to the great sea of being.” Marcus also contends that within this sweeping, never-ending change there is only one true time and that is present time. The present is of equal duration for everyone and it is all we possess. He put it very succinctly, “We live only in the present. In this fleet-footed moment. The rest is lost behind us, or ahead of us and may never be found.” Change for me is a concept of comfort and hope. The level of discomfort I feel will change. The conditions of the world that cause me despair will change. Every particle in the universe is in a state of change. Bringing the mind into harmony with nature was a topic of primary concern for Marcus. We are as much a part of the interconnected nature and as any other part. Conformity with the whole is the good life and the goodness of this world is realized through the study of its wonders large and small. That is how a true understanding of our small place in this whole can begin. It is in this area of nature and beauty that Marcus gave me a revelation I was not expecting from a Stoic — a deeper understanding of aesthetics. He wrote, “Whatever is beautiful owes its beauty to itself…. Praise adds nothing to beauty — makes it neither better or worse. This is also true for commonly praised objects, natural wonders or works of art. … Which of these is improved by praise or marred by criticism.” So beauty simply is. It exists outside the realm of judgement. For me this was a profound insight. It removes the rather arrogant human opinions that we impose on nearly all we experience. While I have found Stoicism a valuable source to better understand my physical condition, I continue to study Stoicism in an attempt to gain a better understanding of this complex existence we are all share. Stoicism provides a practical framework, or design, to live a good life. The following eight paintings are my most recent additions to my Snake River Basin series. 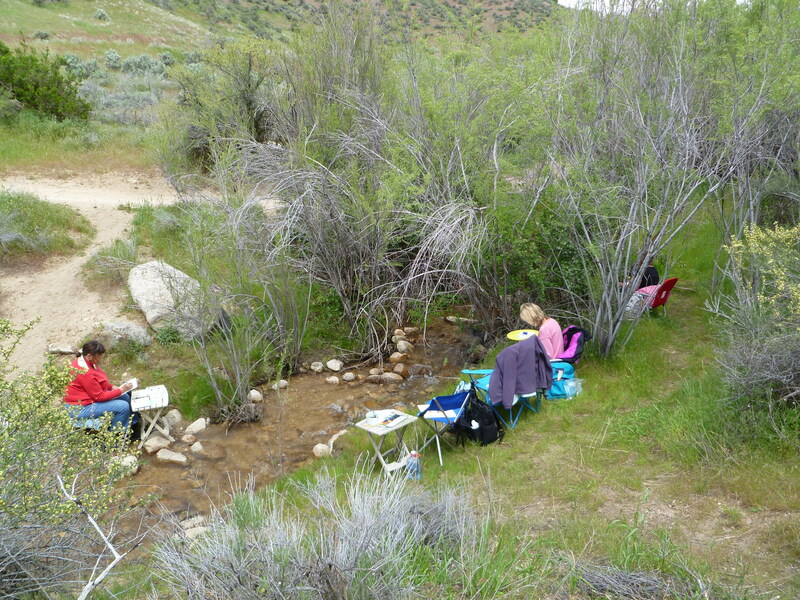 All but the Boise River painting are located in central Idaho, most in the Sawtooth Mountains.